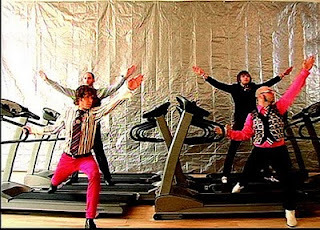 Music Psychos: This too shall pass: OK GO! This too shall pass: OK GO! So I shall start the real blog since my blog is no longer hacked. Today is such a beautiful day in Toronto. It makes me so happy and feel like going for a walk. Yet, I have this project that I gotta get it done. Well, I guess I have something to look forward to once I am done school  Gotta keep positive-thinking! Anyhow, I have lots of updates coming up! First of all, Canadian Music Week was awesome. Despite the fact that I couldn’t go to any of the shows that I have planned as all the tickets were sold out, I still managed to go to a few shows. My favourite was indeed The D'Urbervilles. Their energy was outstanding although the crowd was not in the mood at first. They brought such an amazing show and at the end of the show, the crowd was so into their music. Secondly, I am going to see Butch Walker tonight@@!!!!!! You have nooo idea how excited I am! It is too bad that he is not playing own shows. He is opening up for The Train... sorry for the Train fans, but WHY!? Well I will still enjoy every second of the 45 mins set! I will update the pictures or videos for sure!! Finally, I received a package from the Amazon.com!! I ordered 2 CDs and one DVD. I think I am the one of the last people who still guy CDs lol I still want something tangible I guess with Music. It is a form of art, I think. Anyhow, I got 2 CDs of Ok Go! and the new DVD of the White Stripes ( I haven’t watched it yet, but heard it is amazing!) So right now, I am in the library listening to the new CDs of Ok Go! I think you may have heard of the name of the band, Ok Go! They are quite famous with their outbreaking Youtube Video, “Here you go again” the famous Treadmill video, wowed a number of the audience. I am sure that you are familiar with the video even though you don’t quite know about the band. Well, this band has launched a new video for their new song, “This shall too pass” there are two version of the videos, but this one is amazing. Check it out!